An early start sees myself and brother Neil loading the boat on the mooring at about half six still in full darkness. This procedure takes a good 45 minutes to uncover the boat, get everything on board, catch a few live baits and put everything in its correct place for the day ahead. By the time i start the outboard its just about starting to get light and with Nav lights on we head out and West towards the city centre. 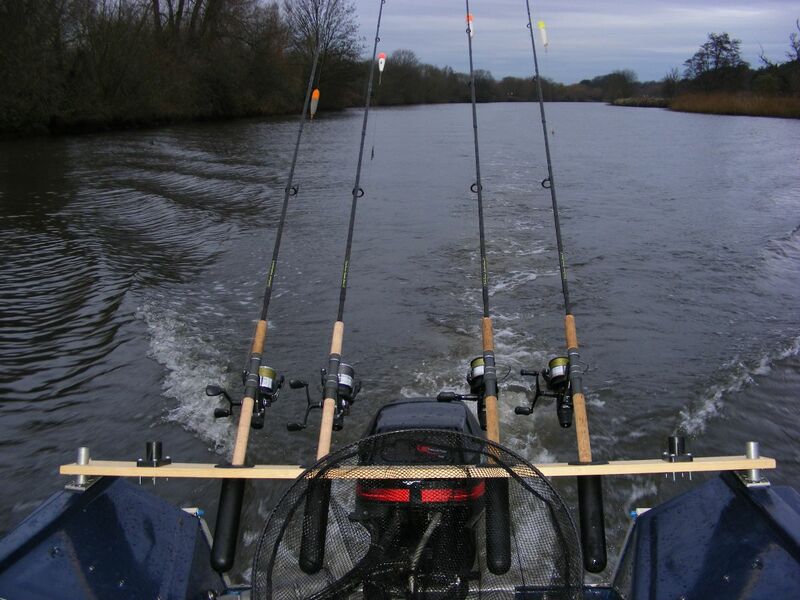 Neil takes the wheel which gives me plenty of time to sort out and set up 4 bait rods and also a lure rod. As we pass behind Norwich City football ground the match men are already lined up ready to do battle. We decide to start in the turning basin so position the boat close to the far bank wall and tie up securely. Once we are happy the boat is secure we position 2 rods each covering a fair area of the basin. 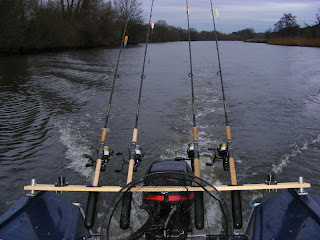 We both opt to fish a Lamprey dead bait on one rod and a small live Roach on our other rods. Thirty minutes pass without any action then my live Roach is taken on my right hand rod, fished out in the middle of the basin. After a good scrap, a lively 5lb "Jack" is in and unhooked before being slipped back quickly. This has us checking the other baits and almost expecting another take fairly soon. Sure enough Neil's Lamprey rod is away and he hooks and lands another 5-6lb Jack. 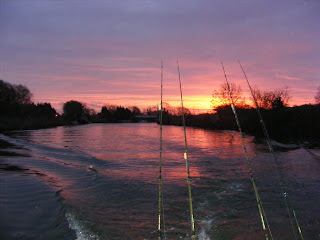 Both fish coming in a 30 minute spell around 9am. We fish on until about 11:30am with no other interest before deciding on a move. 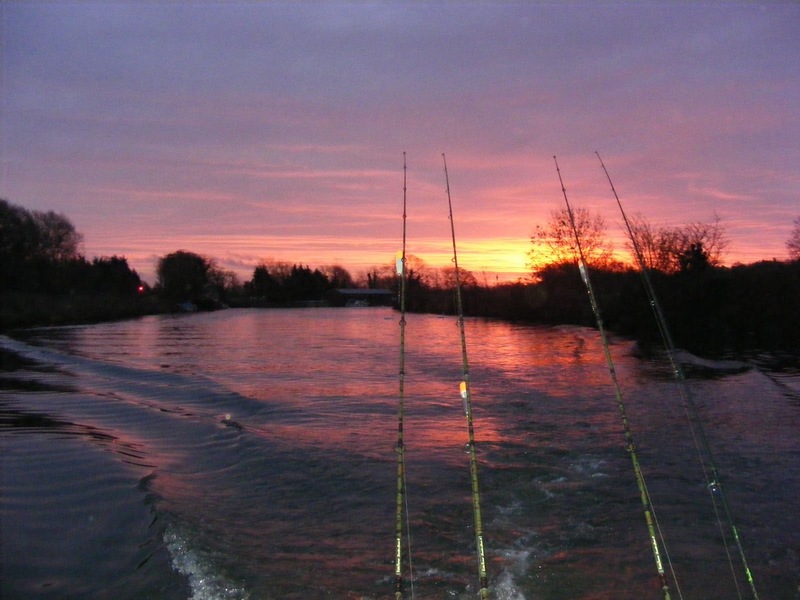 With the short days this time of the year, we agree to motor back to the Postwick outfall area so we can have at least Two more hours fishing. The journey back takes about 40 minutes and the change of scenery is so different. As we leave the concrete and buildings we are out in Green countryside within 10 minutes of leaving the city. Passing Whitlingham Lane outdoor centre, loads of people are out for their Sunday walk watching our strange little boat motor past looking like a mobile tackle shop. We arrive at the outfall and tie up close in so we can fish into the faster water and also try the lures as well. The baits are soon in the water and the kettle goes straight on. Its not the instant fix we both hoped for and soon we are taking turns with the lure rod, trying everything in the box. Approaching our 3pm finish time, i cast several times across the foaming water into the flow and on about the third time on the retrieve, the big jointed plug is hit, Very hard ! The 2.5lb test curve is tested to the limit, the reel clutch also purring away as a decent fish tries to get into the metalwork of the sluice. Neil by now is laying out mats sorting forceps, pliers and scales, and then the big net is ready to land the still unseen "crocodile". Just as i am winning the battle and the fish is near the side of the boat, i get a first and as it turned out, last sight of a good high double. Its mouth flares open wide and with one big shake of its head, its gone. Just foam and ripples left for us to look at. Nothing much is said as we reel in our baits and pack up. I look at the now scared and scratched jointed plug and decide maybe its time to upgrade those little size 4 trebles to something a little more in the 1/0 - 2/0 range. I will also experiment with leaving the barbs on some lures to see if it helps with these lost fish.